The name sounds funny, right? But how often can a soup act as a dip using the same recipe? Surprisingly quite often, actually. 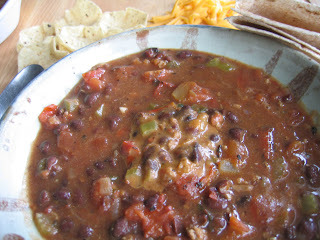 Take this Tomato and Black Bean soup- by adding less water, or just by letting the soup cook a bit longer, you end up with a thick and hearty dip that is perfect with chips and cheese. On the other hand, as a soup it works great with a warm tortilla and cheese as well. When I began making it, I wasn't sure what I was making, and in the end I found two options on my hand. And its a vegetarian option with protein from the beans. Whether you decide to go with a soup, a dip or split it as both- it's warming and filling- keeping you fat and happy! 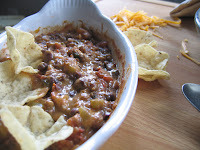 Add shredded cheddar on top and serve with chips or a warm tortilla.